Since writing the post about DIY Fall Leaf Roses, we’ve been asked how to preserve them. 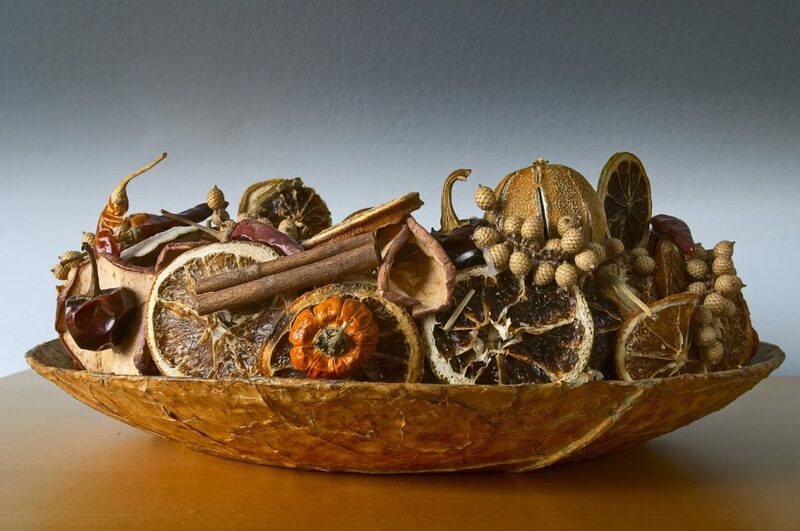 There are quite a few ways to preserve dried leaves and flowers. We’ve listed some of these ways below so you can choose what you like best. If you have other ways, we would all love to hear about them! Glycerin is a great way to preserve dried leaves and flowers. Because glycerin is shiny, the preserved leaves look more natural. This method works with branches or twigs, too. For branches or twigs, cut off the tips of the stems or twigs and crush the ends to increase absorption. Use 1 part glycerin and 2 parts water. Heat the water to 150-180°, then add the glycerin to reduce the temperature to 100°F. Make sure to use plenty of the mixture for the stems to absorb the glycerin – they will need to be completely covered. Place the leaves, branches, and twigs in the mixture to soak. This process takes 2-6 weeks. You can tell it’s complete by how the leaves will look. They typically turn a greenish brown. Pro Tip: Check levels daily and replenish with water only. Use 1 part shellac and 2 parts denatured alcohol. Dip the leaves or flowers into the mixture or apply with a paintbrush. Make sure to do this in a well-ventilated area or outside. Spray the entire leaf or flower with hairspray. Coat 3-4 times for best effect. I use modge podge to protect and preserve complex puzzles when finished. It’s also perfect to preserve leaves. Simply apply it with the brush provided. We recommend two coats, allowing the first coat to dry completely before applying the second. Thank you to our reader Carol for her suggestion of wax (aka paraffin)! Dip in hot wax, drain the excess and let dry – just be careful not to get hot wax on your hands! She said her leaves have lasted over 40 years! 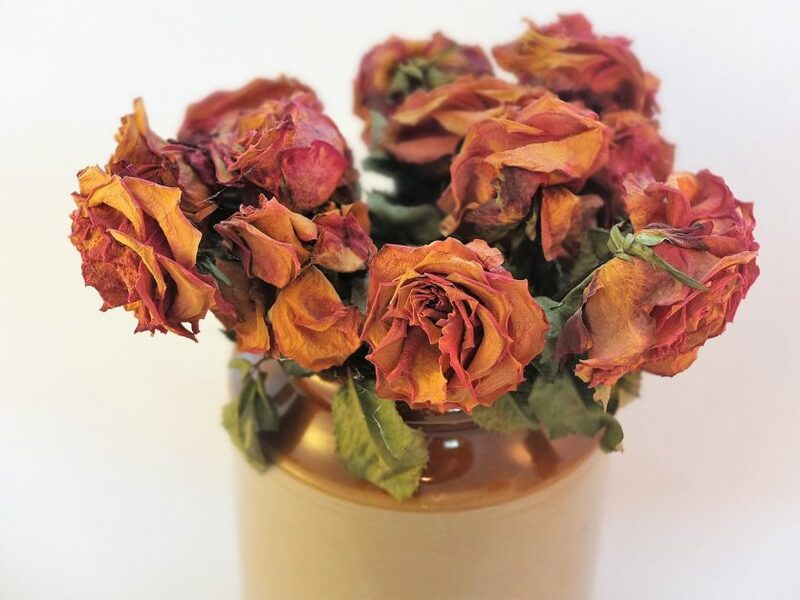 Our fabulous reader, Rosemary, suggests acrylic spray to preserve dried leaves and flowers. It holds the color well and is easy to apply. Be sure to form the leaves and flowers into any shapes you want first as the spray becomes stiff when dry. When I looked for it on Amazon, I noticed Modge Podge makes one of these sprays too! 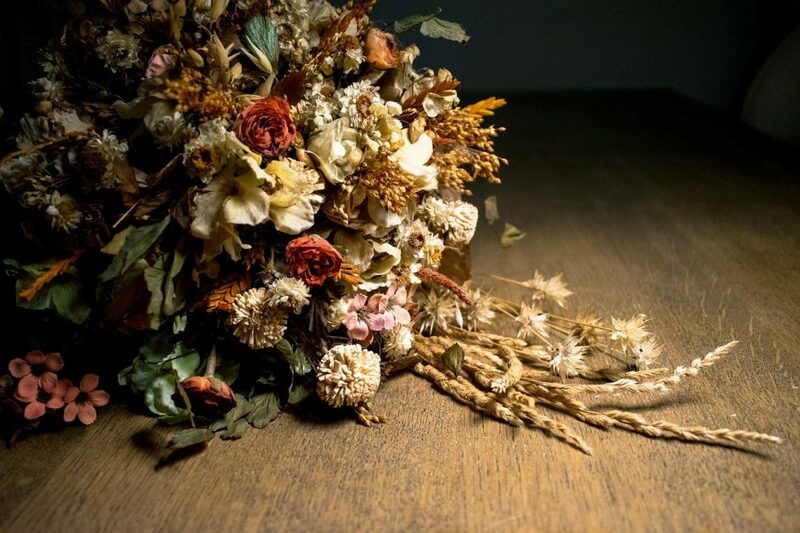 What other methods do you use to preserve dried leaves and flowers? We’d love to hear from you and see pictures! Acrylic spray allows the leaves hold their color well. I would spray the the roses a few times after forming them, not before. It would be important to gather up your leaves and form the roses while the leaves are very flexible.. Thank you for the suggestion Rosemary!Is it similar to hairspray? coating in modge podge works as well. Do you immerse in mod podge or paint it on? Hi Bert, Heat the water to 150-180 degrees, then add the glycerin to it to bring the temperature down to 100 degrees. You can immerse entirely. I prefer the hairspray or modge podge method myself. Do you immerse the leaves before or after putting the leaves together? I treat my leaves after they are put together as roses. i have also dipped leaves in melted parafin and they last for quite some time. Great idea! I will have to add this to the post. Have you liked our Facebook page yet? I’d love to hear more of your tips on the page as well! Great idea to add glitter to the tips! I’d love to see a picture of it… share it on our Facebook page! I don’t them to change colors. I like the leaves being a yellow or reddish color. We see enough of em brown here in Texas as it is. Will just spraying them with acrylic spray after they are formed work just as well? My leaves hold their color pretty well through the season and some I get to use several years when I spray them with clear acrylic as soon as I get them home. So I think it would be key to form the flowers immediately and then spray quickly also. So you just pick one way. You don’t have to do the glycerin. Then hairspray and then modgepodge? Yes, that’s correct Elaine. You just pick your preference! I prefer hairspray because it’s the cheapest version but the modge podge is something I have on hand from puzzles. How well do they hold up to handling with the hairspray? What happens if you fold green leaves , will they still turn color? I don’t believe they will change color but they will die if you don’t preserve them. Thank you for posting the lovely flowers, Neat idea. Years ago, when we would collect leaves as kids, my Mother would iron them between two layers of waxed paper between two tea towels. Leaves stayed bright and flexible. Lasted for a long time. I remember this being done too! I had forgotten until you just mentioned! They do remain beautiful and vibrant. I wonder if it would work with the flowers… probably would crinkle the wax? Curious how to keep these from not getting so thick at the base of the flower? Am I maybe doing it wrong? If you start with smaller leaves, they won’t go the entire way around. Then use larger leaves to tuck it all together. That will help with the base size. Sure, what is the question? I have successfully preserved my leaves by placing them between two pieces of waxed paper, make sure the waxed side is inside. Cover with a piece of a brown paper bag or a tea towel/dish cloth. Then using your iron set on a med/high heat, run it back and forth across your leaves until the wax is transferred. Be sure to peel the paper off immediately or it will stick to your leaves as it cools. Lift your leaves by their stems and place on a clean surface and allow them to cool completely. Depending on what you intend to do with them will determine how long they will last. I like to scatter them around for an “Autumn” feel inside. I learned this when I was in Grade 7 from a Home Economics teacher. 45 years ago! Thank you for the great tip! I wonder, will this work with the fall leaf roses on our site? I want to make a magnolia wreath of preserved leaves. Can I add regular food coloring to glycerine mixture to preserve green color? I don’t have the answer for you Jane but if you try it, let us know how it works! I have some leaves I cherish from a wonderful place I used to work. I put them between the pages of books so they are dry and have stayed there for many years. I want to preserve them and hang them in my home. I am wondering the best way since they are already dried and have been this way for years. I seems that some of the instructions are for fresh leaves picked and flattened and may still have some moisture in them. What is your suggested way for my leaves so they don’t break? I’m fine with them staying flat. I’m thinking wax paper, but want to get your advice. Thanks! 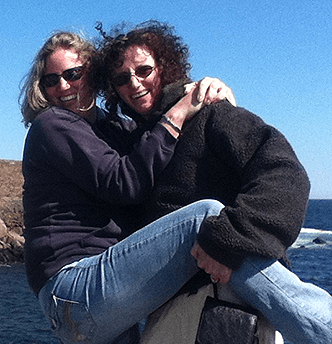 Hi Joanne, Thank you for reaching out! While we aren’t experts, I feel wax paper is a good option. You might want to try Mod podge even but I would start on just one and see the results first. Hi Joanne, Thank you for reaching out! While we aren’t experts, I feel wax paper is a good option. You might want to try Mod podge (you can find it at Amazon: http://amzn.to/2FVjuA0) even but I would start on just one and see the results first. Hairspray question: do you spray stems and branches before or after they dry? I would try it. You have nothing to lose! I personally think either way will work.